As a Hospice Executive Are You Looking for Critical Competitive Data to Stay Ahead of the Curve? Look No Further… The 2017 State Hospice ProfileTM contains comprehensive hospice care details for each county in your state based on Medicare data from 2003-2017, providing the critical information about your competitive landscape. Produced by HealthPivots and marketed exclusively through the NHPCO Marketplace, each 2017 State Hospice ProfileTM provides vital county-level information on each of the leading providers. Full-colored charts and graphs provide information from an analysis of the last sixteen years of Medicare claims data. 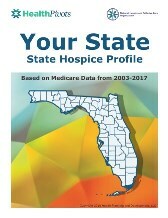 Each State Hospice ProfileTM contains a National and Statewide Profile of hospice care based upon Medicare claims data. Contact the NHPCO Solution Center at 800-646-6460 for pricing information and to place your order. Prices vary per State Hospice Profile™. Please note that there are NO returns for this item.